Several months ago, I sent out a mass email to our existing customers encouraging them to share their home photos of their TV lift cabinets with us. My goal was to be able to share these home photos with you all as I know that the best reviews are ones that come directly from other customers. The response I got from this email blast, was overwhelming positive. Our customers were excited to share their home photos and show off their beautiful TV lift cabinets. Below is a review I received from Ben from Vancouver, MA. 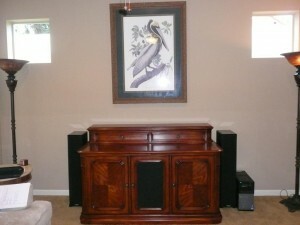 Ben purchased the Banyan Creek TV Lift Cabinet and opted to switch out the wood panel for the speaker cloth. “We moved into a new home with an open kitchen into the living room design. So with an “L” shape couch on one wall with windows and a fire place on the opposite wall that left only one wall for the television and to hang a very large framed pelican print. The solution to our problem was this beautiful TV lift cabinet. This way when we were not watching the television we could still view the pelican print. We were very nervous about ordering this sight unseen, but we just couldn’t find anything locally that we liked. When it arrived we were absolutely thrilled! The craftsmanship and quality of this piece is outstanding. The delivery crew was professional and had the cabinet unpacked and in place in less than 45 minutes. We cannot say enough good things about our experience with TVLiftCabinet.com.